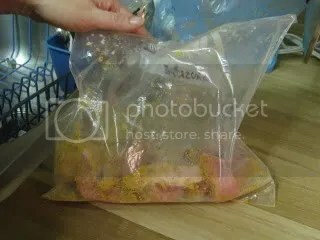 Posted by Toy Lady in Cooking, Cooking Challenge, random stuff. A while back, I stumbled upon a new (to me) blog. I don’t even remember how I found My Wooden Spoon, but I did, and I liked what I saw, so I added Lori the Cowboy’s Wife to my rapidly increasing list of blogs on my “Google Reader.” And I wonder why I don’t seem to get as much accomplished during the day as I used to! Anyway. A couple of weeks ago, a new Food Challenge was announced, and boy, did my ears perk up! Peeps and I greatly enjoyed “Hobo Mondays Tuesdays” and were disappointed when Michelle discontinued that challenge. But, you know, life goes on, right? We started our own Third Thursday challenge, and now the, what? Wooden Spoon Mystery Ingredient Challenge? I don’t know what she’s calling it, but we decided we wanna play! The rules seem simple enough – create an original recipe using all three of the named ingredients. Oh, and take a picture of the final dish. Fortunately, the rule isn’t “take a not-sucky picture,” because I think that would be kind of beyond me. . .so here we go! First off, here’s my philosophy regarding “original recipes” – often when I cook something, read a cookbook, watch a chef, I learn something. It may be a technique, a food combination, or even a way of looking at and thinking about a particular ingredient. Many “original recipes” I’ve made have been inspired by, or springboard from, something else; they often start when Peeps or I look at a recipe or tasted a finished dish and say “what if we . . . ” Or, in this case, if we’re presented with a trio of ingredients. What if we. . .
. . . fiddled with our cinnamon honey chicken tenders? I mean, say, instead of breadcrumbs seasoned with cinnamon and nutmeg, we started with corn flakes, and seasoned them a little differently? That should work quite nicely, don’t you think? A little mustard and sage, but not too much, allowing that sweet, um, corniness to come through, and, ultimately, complimentary to the “hot sauce” that’s to come. But you know, using corn flakes to bread chicken? I mean, wow, how original. Besides that, we’d just roasted a chicken a few days before, and we had leftovers from that we’d been working on, so, well, let’s do something a little different, huh? Like, say, some boneless pork loin? 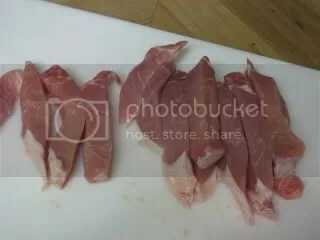 Heck, if you can swap chicken in virtually any pork recipe (within reason, of course), you should be able to use pork in place of chicken, right? Of COURSE you can! So we pulled a package of three boneless chops out of the freezer, and I sliced them into strips. 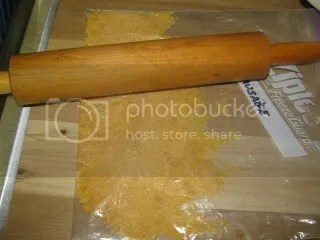 Then roll (or shake) the fingers in the corn flake mixture, and lay them out on a parchment (or silicone) lined (or well-greased) baking tray and bake for 15 minutes at 425°. While we have other hot sauce in the house (I think), Peeps has a clear preference for Tabasco. Me, I think it all kind of tastes the same – what can I say? A tablespoon of hot sauce may seem like a lot, but it’s really not. We’re mixing it with four times as much honey, and 4 more times as much butter – not to mention the pork and corn flakes. It’s well-diluted, fear not! 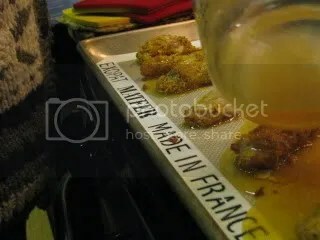 Once the pork strips have baked for 15 minutes, go ahead and pull them out of the oven, and pour the honey-butter-hot sauce mixture over them. 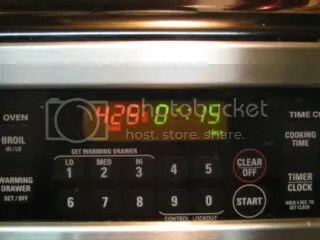 Be sure to thoroughly coat them, then stick ’em back in the oven to finish cooking, about another 10-15 minutes, or until the meat is done, but not dried out. 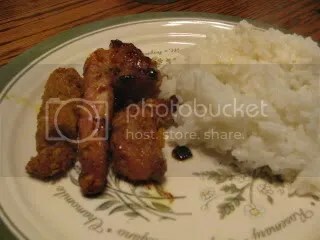 Or course, the breaded pork strips could easily be made in bulk and frozen on sheets to be baked and sauced later. The bottom line – we found these pork strips delightful! They were sweet and kind of, I don’t know, zesty – not too hot (which is good for me! ), but you definitely taste the zing! of the hot sauce. I would definitely do this again – I really liked the hot-sweet combination of the honey and hot sauce. And WHO KNEW corn flakes would be so indestructible? Even after being crushed, then stuck to the pork, then baked, then coated with honey, they were STILL crispy and, well, kind of corny. . . but in a good way! We all know I’m photo-challenged, so here’s the picture of the finished dish – believe me, that’s the best of the half dozen I took! It looks like there are a few other entries up at My Wooden Spoon, so be sure to check them all out when you have a minute! I love that you did this with pork! Will have to give this one a try myself I think. Oh that is original, I didn’t even think of using pork. 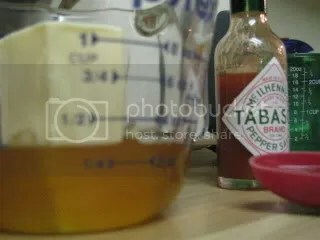 I may have to try the honey butter hot sauce bit the next time I make some tenders as that sounds really good!